For a modern day “Golden Age”, the Invicta Women’s Wildflower Mother of Pearl Dial Shiny Gold Leather Quartz Watch 1033 is an adornment to glorify its splendor. The gold bezel and strap along with the mother of pearl dial radiate a brilliance that is unmatched in contemporary fashion. Elegant and refined, this watch is for ladies who are looking for a beautiful and practical watch. Fashionable Features: If you love gold, then this watch is for you. From the shiny gold leather strap, to the 18 karat gold plated bezel with a beaded design, this watch is glistening with gold. The 18k gold plated stainless steel case and gold tone hour, minute, and second hands accentuate its golden grandeur. The white mother of pearl dial adds a shiny touch to the sparkle of this magnificent timepiece. No need to put on contacts or glasses to see the time. The hours are marked with enormous black Arabic numerals that form a well-balanced contrast with the white dial, making it easy to view the time at a glance. Along with the glamor of the Invicta 1033, there are several neat and practical features. With a busy schedule, it’s easy to forget the date, but the calendar feature at the three o’clock position will remind you. Water resistant up to 100 meters or 330 feet, the current “Golden Age” woman is properly equipped for underwater adventures. The Swiss parts quartz movement is well protected by a durable flame-fusion crystal. Drawbacks: While this watch has many incredible features, it does have several drawbacks that you should know about before purchasing it. While the gold leather band is adorable, it’s not perfect. Over time the gold color on the leather wears away in certain spots, giving it more of a worn look and making it appear as if it truly were from the ancient “Golden Age”. Even though it’s inconvenient, there’s an easy modern day solution: buy a replacement band. Although the dial is labeled with large numerals in five-minute increments, clearly labeled one-minute increments would enhance your accuracy and precision of telling time. Despite these flaws, the Invicta 1033 is highly sophisticated and functional. Silver Style: If you prefer silver over gold, you may be interested in the Invicta Women’s Wildflower Mother of Pearl Dial Shiny Silver Leather Quartz 1034. It’s the same style as the 1033 model featured in this review, except it’s silver. 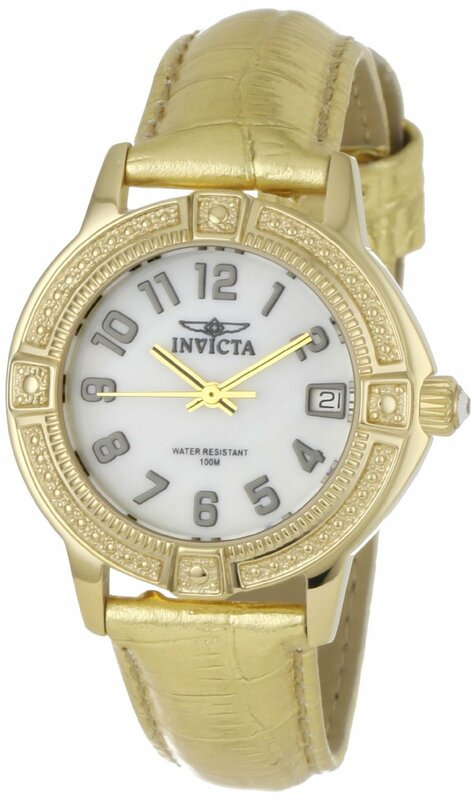 Price: The U.S. retail price is $595 for the Invicta 1033. Shopping online, it is either sold out or listed as out of stock on several websites. However, it is still available, and is currently selling for as low as $150 at discountedwatchesforsale.com. If you take the time to look online, you can invest in this spectacular gold timepiece while conserving your money.